A lot happened this past month in the world of audio. 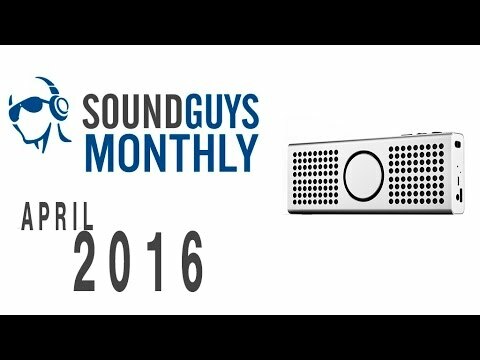 We're also giving away the Ultra Slim by CB3, but with a twist in this episode of Sound Guys Monthly. There were plenty of things of note that happened this past month. Not only is Amazon releasing two new audio products, but Samsung may have found the cure for VR motion sickness. It was an interesting month all around but first, let’s all congratulate the Shawn F. from Norway on winning last months giveaway of the Bose SoundTrue II headphones. We have another giveaway this month with a slight twist that we hope will make you happy if you didn’t win. The company already has the Amazon Echo, a Bluetooth speaker with a personal assistant that you can do all sorts of things with. Now they have two more. The first is the Echo Dot, which isn’t exactly a speaker in itself but rather an accessory that you can plug into a speaker. It can still speaker to you and play music, but don’t expect any amazing quality or loud sound unless it’s playing out of a different, preferably better speaker. Once plugged in, it gives any speaker Alexa capabilities, letting you ask it questions, set timers, tell the weather, and more. The second product announced was the Amazon Tap, which looks more like the standard Bluetooth speakers that we’re used to. As of right now, the Dot can only be purchased if you already have an Alexa-enabled device for $89. But the Tap is available now for $129. Sony has their hands in almost every aspect of technology, and audio is no exception. They have tons of headphones and speakers, but their most recent announcement is a little different than what we’re used to. Simply dubbed Concept N, these are an interesting new pair of wireless headphones that Sony was showing off at this years SXSW in Austin, Texas. These wireless headphones are unorthodox in that they don’t have any actual earbuds or ear cups. Instead, they have small firing speakers that aim sound at your head, making your own personal bubble of music. People around you can hear that you’re listening to something, but they won’t be able to tell what. Samsung also made news this month with a new pair of headphones that they hope will fix the nausea people get when entering (watching? viewing? experiencing?) virtual reality. Samsung has been one of the first major companies to push VR commercially with their Gear VR headsets, which require you to strap a galaxy phone into a pair of goggles and use it as a screen. But some people begin to get motion sickness because they’re seeing things that their brain knows isn’t happening. These headphones try to fix that by tricking your brain via your inner ear, which is responsible for balance and perception of space. You might know Crazybaby because of their futuristic hovering speaker the Mars, but now they have another Kickstarter for the Luna. A slightly less cool, but also slightly more useful speaker. The Luna is a small wireless speaker that you can connect to with Bluetooth or over your home Wi-Fi network. As a Wi-Fi speaker, you can connect up to 32 Lunas on a single network allowing you to have synchronized audio in every room. The circle in the middle or “the eye” can also change colors and you can choose form thousands of them to match your mood, or whatever color you feel like looking at that day. You can back the speaker for $129 and it’s expected to ship in October of this year. Most speakers require you to stream music from your device but, similar to something like a chromecast, the E3 pulls the music down directly from the cloud. The speaker lets you stream from a bunch of top streaming services like Spotify, Pandora, and Tidal just to name a few. You can also connect with Bluetooth, but if you connect it to your home Wi-Fi it’ll pull the music right off the service, leaving you free to use your phone for phone things. There’s also an app that lets you set the speaker up as an alarm and it has a USB output on the back so you can charge devices. You can back the E3 for $79 and they’re expected delivery is May of this year. This past month we reviewed a few things, the coolest of which had to be the Plantronics Backbeat Pro+. There were a little too many controls for my taste, but they all worked perfectly. These headphones sound good, are fairly durable, and has a crazy long 24 hour battery life with active noise cancelling and Bluetooth turned on. The design doesn’t look too different fro the originals, but it’s an iterative update that gives you a ton of features at a decent price. Personally, I wasn’t a big fan of the design but I’m sure there are people out there who find these gorgeous. This month our bang for your buck pick is a pair of in-ears by ADV.Sound called the M4‘s. Quality earbuds are hard to come by for under $50. Actually, they’re borderline impossible. Out of the thousands of models out there there are only a select handful that are worth the money. One of them being the M4’s. Build quality is good, sound quality is even better, and at only $40 we have no problem recommending these. With warmer weather on the way large over-ears can be hot and uncomfortable, so if you’re looking for a solid pair of ‘buds that you can toss in your pocket without them getting tangled, these are worth picking up. We have a ton of best lists that you should check out, but if you haven’t yet we’ll give you a good push in the right direction to get you started. This month, you should take a look at our list for the best computer speakers. Bluetooth speakers are great and all, but sometimes you don’t plan on moving them from your desk anyway. Why get a Bluetooth speaker for your desk when you can get a good pair of computer speakers? This list has a few of the better ones. Maybe you want a speaker that looks cool on your desk, or you want really good sound but don’t want to invest in studio monitors. Either way, this list has you covered. For this giveaway, we’re doing something a little different for the giveaway. Instead of giving away just one product, we’re giving away three Ultra Slim Bluetooth Speakers by CB3 Audio. CB3 Audio is a partner of Sound Guys so we were able to snag more than one this time. All you have to do find the widget below to enter. Hopefully next month you’ll be one of three names that gets announced. As always, the giveaway is international so make sure you enter because who doesn’t like free stuff? CB3 Ultra Slim Bluetooth Speakers Giveaway! Full disclosure: CB3 Audio is a partner of Sound Guys.